1 registered (Alan H.), 6 Guests and 0 Spiders online. 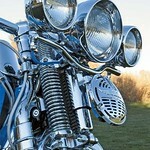 "Heritage Springer" is a trademark of Harley-Davidson. No attempt is being made to take away from Harley-Davidson and their legally owned trademark. Harley Davidson and Heritage Springer trademark names are used only for reference and descriptive purposes.